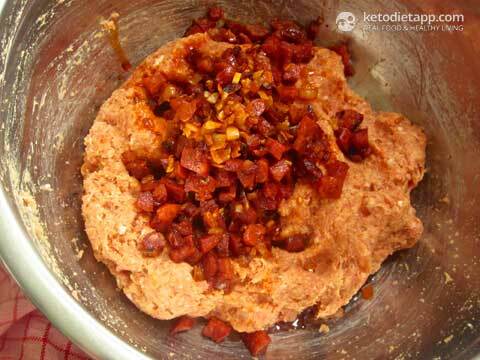 I love using ingredients like bacon and chorizo to add flavour without unwanted carbs. Chorizo is slightly spicy and great with the mild taste of cauliflower when added to cauli-rice and cauliflower soup. 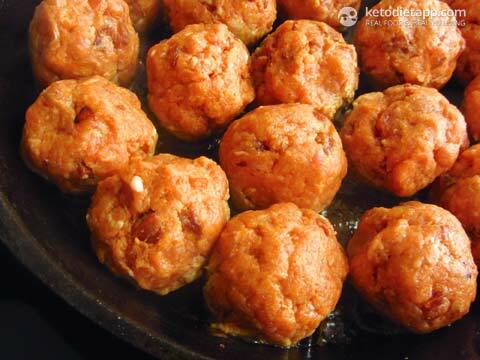 In this recipe, I added crisped up chorizo to meatballs and guess what - it is delicious! I've been making these meatballs for the last couple of years and they've always been popular in my house. Last time I served them with my Keto cheese sauce and Buttered brussels sprouts. However, if you are dairy intolerant, you can skip the cheese sauce. 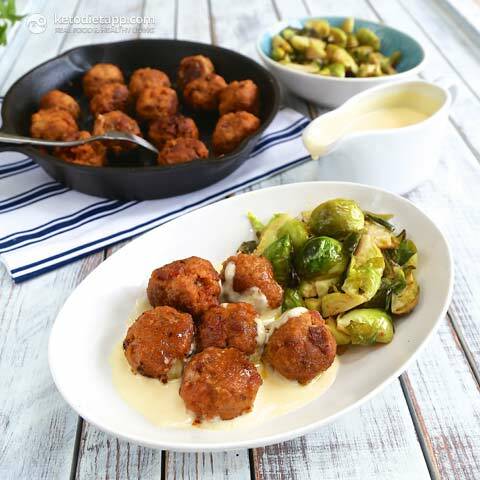 The meatballs are quite moist so you won't need to add any additional sauce and can serve them over crunchy lettuce salad, with steamed broccoli or asparagus. Peel and dice the onion and garlic and dice the chorizo sausage. Grease a large pan with ghee and add the chorizo, garlic and onion. Cook for 5-8 minutes over a medium heat or until lightly crisped up. Take off the heat and set aside. 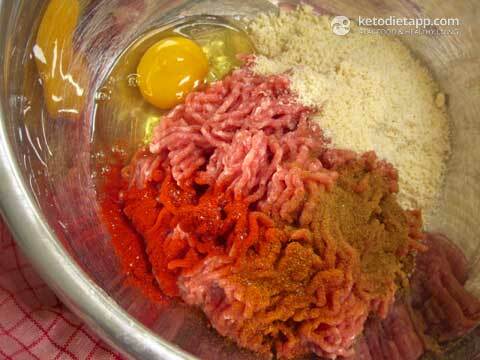 In a mixing bowl, combine the ground pork, egg, almond flour, paprika, cayenne pepper, ground cumin and salt. 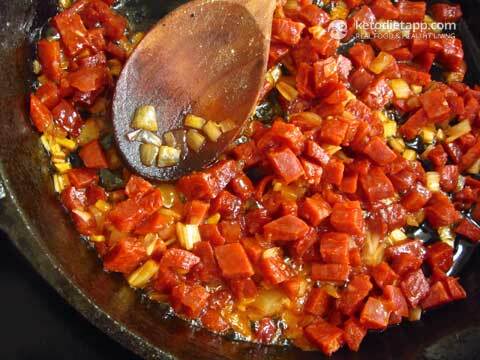 Mix until well combined and add the crisped up chorizo, garlic and onion from the pan using a slotted spoon. Using your hands, make small-medium meatballs and place on a cutting board. Heat the pan where you cooked the chorizo and onion over a medium-high heat. Once hot, add the meatballs and cook for 2 minutes. 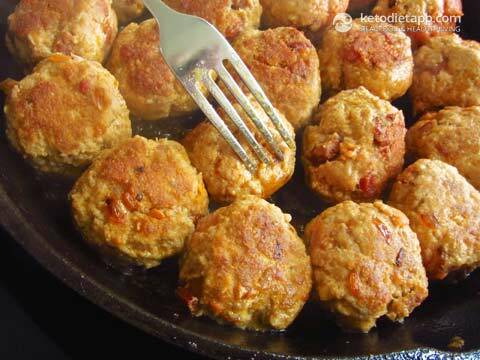 Once browned, turn the meatballs on the other side using a fork and cook for another 2 minutes. Reduce the heat to medium and cook for 5-10 minutes. The time depends on the size of the meatballs. Remove from the heat and serve immediately or let it cool down and store in the fridge for up to 5 days. To store them for longer, place in a zip-lock bag and freeze. 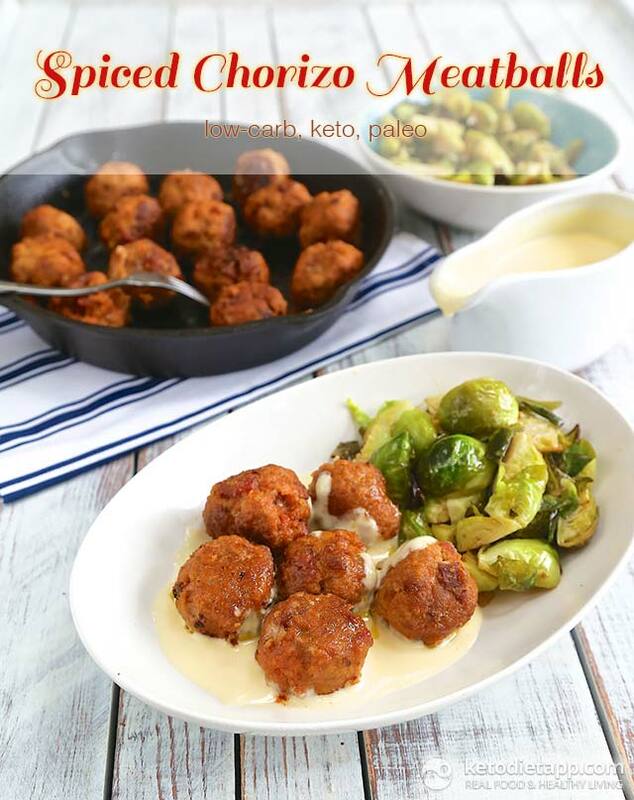 For a complete meal, try with Keto cheese sauce and Buttered Brussels sprouts! 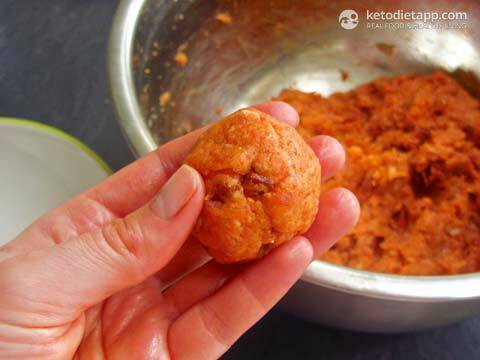 Hi Christine, I haven't tried making these (or meatballs) in the Instant pot but would use the Sautee program to do that (just like on the skillet). I also make beef meatballs, adding bacon and garlic. It is a safe option when having guests with kids, everybody eats it, including the little fussy ones ! Have you tried baking these instead of cooking them on the stove? Wow, wow, fabulous, & so easy to make & cook. Wow, these are great! I made these tonight and the whole family loved them. I did them with your cheese sauce, thank you so much for rescuing cheese sauce and putting it back on my menu as whatever other method I try most attempts end in a messy tasteless goo. This is so easy and tasty. Thank you Chris!! This is my favourite recipe too! It goes great with both the cheese sauce and tomato "marinara-like" sauce (slightly more carbs). 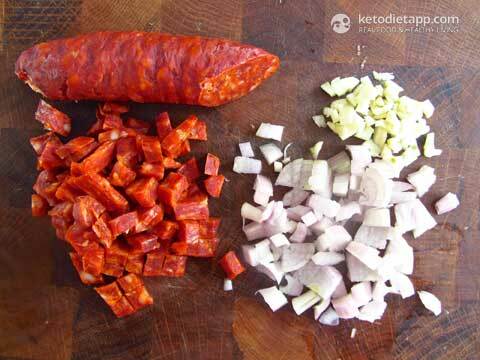 Spanish Chorizo is very expensive and hard to find where I live, but Mexican Chorizo is plentiful and inexpensive; therefore, I wondered if you have any idea if Mexican Chorizo would suffice to supplement? Hubby's favorite way of eating chorizo (ground) is in dirty cauli rice. I use it for a Paleo pizza base--no need to grease the pan, because it already has enough fat in it to grease it FOR you.